Philip (PJ) Hamel, DVM, MPH, is a diagnostic imaging resident at the University of Florida College of Veterinary Medicine. His professional interests include diagnostic imaging of domestic and nondomestic animal species, as well as image-guided interventions. He is originally from Massachusetts, where he attended veterinary school at Tufts University. Welcome to our series of articles on small animal abdominal ultrasonography. The initial articles provided an overview of basic ultrasonography principles and a discussion about how to perform a systematic scan of the abdomen. The rest of the series discusses ultrasound evaluation of specific abdominal organs/systems. Read the other small animal abdominal ultrasonography articles published in Today’s Veterinary Practice at todaysveterinarypractice.com. AFAST and TFAST (abdominal and thoracic focused assessment with sonography for trauma, triage, and tracking) constitute limited ultrasound examinations that focus on identifying the presence of fluid within the peritoneal, pleural, and pericardial spaces. Examination findings are used to direct immediate patient stabilization efforts, and serial studies can be used to monitor hospitalized patients. In the emergency setting, focused ultrasound examinations are increasingly being used as extensions of the physical examination, and thorough descriptions of these examinations have been published.1–4 This article provides an introduction to performing and interpreting the AFAST and TFAST examinations. AFAST and TFAST are not intended to be comprehensive examinations. They are subject to numerous technical limitations, including the operator’s skill level, the quality of available equipment, and the fact that they are often performed in suboptimal conditions (e.g., stressed patient, loud room, bright ambient lighting). Despite these limitations, adhering to a consistent protocol should help to maximize the diagnostic yield. Patient stability at the time of presentation to the emergency service may determine scan position and the extent of patient preparation. Generally, the patient is not shaved for the examination, unless ultrasound-guided sampling or other interventions are performed. If the patient has a very long or thick coat, shaving will be necessary. Isopropyl alcohol and/or acoustic coupling gel should be used. The AFAST examination can be performed with the patient in one lateral position. A complete TFAST examination is performed with the patient in alternating left and right lateral recumbency or in sternal recumbency. Dyspneic patients should be provided with supplemental oxygen and should be scanned in sternal recumbency. AFAST and TFAST examinations should never be prioritized over immediate life-saving therapy. Image optimization requires a basic understanding of the ultrasound machine controls. For a given window, image depth and focus are optimized first. The gain (2D) is generally set at 70% (depending on the company and machine) to create an image that can be viewed in a room with high ambient lighting. B-mode or 2D grayscale (“brightness”) mode ultrasonography is used, and different echogenicities are represented by relatively bright/white (hyperechoic) and relatively dark/black (hypoechoic) shades of gray, between the two extremes of white and black. The darkest, most hypoechoic extreme is termed anechoic, meaning “without echoes,” and is typical of fluids (transudate, modified transudate, and some types of exudate). 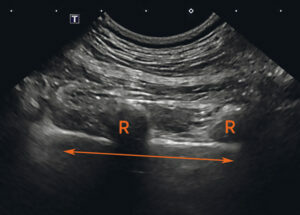 In human emergency medicine, thoracic ultrasonography has been shown to be a rapid and accurate test for identifying pneumothorax.7 Correctly identifying pneumothorax, however, requires the ability to distinguish reverberation artifact—which is created when the ultrasound beam encounters gas within the pleural space—from the typical normal pattern of a glide motion seen within the lung (see TFAST Techniques). Figure 1. Locations for the 4 AFAST windows, shown with patient in right lateral recumbency. For each window, an examination should be performed with the ultrasound probe in a long and short axis relative to the patient. The HR probe image has decreased opacity because to obtain images, the probe must be placed underneath the dog or cat and directed dorsally and cranially at the level of the 13th rib. If stable, the patient can be turned over so that the left side is down and right side is up. CC, cystocolic window; DH, diaphragmatic-hepatic window; HR, hepatorenal window; SR, splenorenal window. The technique for performing the AFAST examination is described in detail elsewhere.1-3 Four acoustic “windows” are assessed in a complete AFAST examination (Figure 1). At each window, compose the image so that the machine company logo is on the left of the screen, indicating that the transducer marker (or “notch”) is pointing cranially, along the long axis of the patient. Then rotate the transducer 90° so that the notch points toward the patient’s right side. This results in the right side of the dog or cat being oriented toward the left-hand side of the ultrasound image on the screen, as viewing a ventrodorsal radiograph of the abdomen. To obtain the diaphragmatic-hepatic (DH) window, place the transducer in a subxiphoid location. Sufficient image depth and cranial angulation of the beam are necessary to visualize the interface of the hyperechoic, curvilinear diaphragm-lung interface with the coarse echotexture of the hepatic parenchyma. Image depth and focus should be optimized such that the diaphragm is located in the far field of the image display. Figure 2. Diaphragmatic-hepatic window showing the liver (L), diaphragm (D), and a large volume of interposed peritoneal effusion (E). Fan the ultrasound beam to the patient’s left and right, following the contour of the diaphragm, while maintaining a sagittal imaging plane along the long axis of the patient. In a normal patient, the liver and diaphragm remain in direct contact. 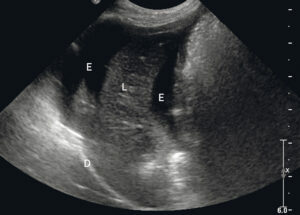 If peritoneal effusion is present at this window, it may appear as anechoic material between the liver and diaphragm or between liver lobes (Figure 2). A complete assessment at the DH window includes an assessment of the gallbladder and transdiaphragmatic visualization of the pericardium. The gallbladder is positioned to the right of midline between the right medial and quadrate lobes of the liver in the dog and within the right medial lobe in the cat. In normal dogs and cats, the gallbladder appears as a thin-walled, ovoid to rounded structure containing anechoic material. In a typical small to medium-size dog, the gallbladder can easily be found from the original subxiphoid position by fanning the probe toward the patient’s right. The DH window provides a good acoustic window to the heart. In cats and small and medium-size dogs, minimal adjustment of imaging parameters (depth and focus) will be necessary to visualize the apical portion of the heart. 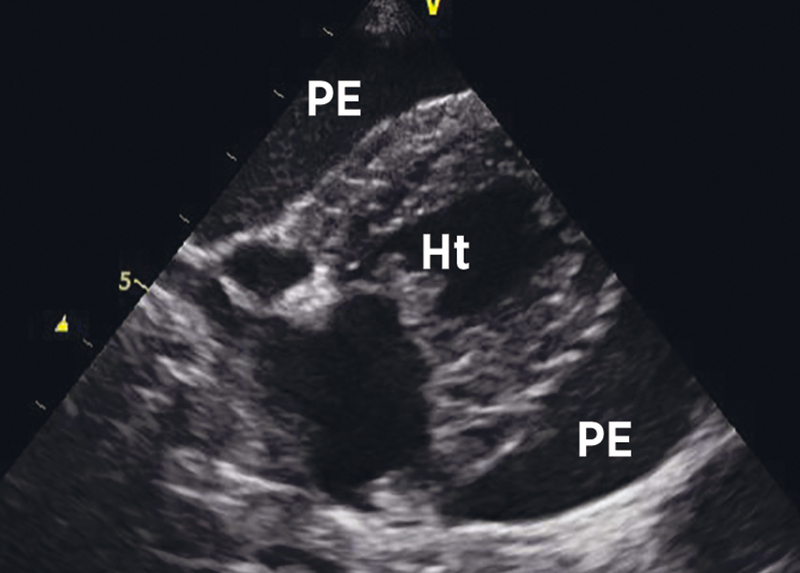 If readily apparent, pericardial effusion can be seen as anechoic material surrounding the cardiac apex, bordered by a thin, echogenic interface representing the pericardium. Using this window alone, it may not be possible to differentiate between pericardial and pleural effusion; thus, a complete TFAST examination is warranted in dogs or cats when pleural or pericardial effusion is present. Figure 3. 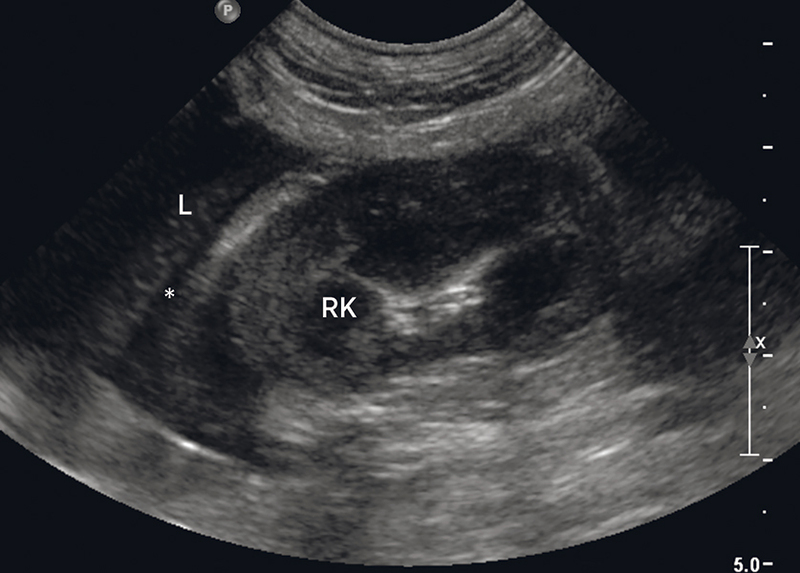 Splenorenal window showing the left kidney (LK) and a large volume of peritoneal effusion (E). The large volume of effusion has displaced the spleen out of the current window. If the patient is positioned in left lateral recumbency, the splenorenal (SR) window will be located within the dependent flank. The window is defined as the interface between the homogenous echotexture of the spleen and the ovoid, typical mixed-echogenicity appearance of the kidney. The normal kidney has a hyperechoic outer cortex and a relatively hypoechoic inner medulla. Because both the spleen and the left kidney are mobile, they may not be found immediately adjacent, and small intestine or mesenteric fat may be present in the space between. For many operators, examining the dependent flank is challenging, but external anatomic landmarks can be helpful. Compose a long axis image by placing the probe in the dependent (left) flank caudal to the 13th rib and ventral to the lumbar hypaxial musculature. While maintaining a long axis image, fan dorsomedially to search for the left kidney. With the kidney centered, fan lateral and cranial to identify the spleen. Anechoic material adjacent to renal or splenic parenchyma, between loops of small intestine, or within mesenteric fat represents peritoneal effusion (Figure 3). Small volumes of fluid located immediately adjacent to the kidney may be difficult to distinguish as peritoneal or retroperitoneal. The AFAST examination can be performed with the patient in one lateral position. A complete TFAST examination is performed with the patient in alternating left and right lateral recumbency or in sternal recumbency. The primary landmarks used to orient the cystocolic (CC) window are the urinary bladder and the ventral surface of the descending colon. To generate this window, place the probe caudally along midline with the marker oriented cranially to create an image along the long axis of the patient. The body of the urinary bladder is mobile and typically falls to the dependent flank, so it may not be readily apparent on initial probe placement. Too much pressure on the probe can collapse or displace a small volume urinary bladder and make identification challenging. The normal urinary bladder appears as an ovoid structure containing anechoic material, surrounded by a thin echogenic wall with 3 discernible layers. The colon generally contains gas, which generates dirty distal acoustic shadowing and reverberation artifacts originating at the luminal mucosal surface, and/or feces, which is often associated with clean distal acoustic shadowing. These artifacts will interfere with image generation of structures deep to the colon. Figure 4. 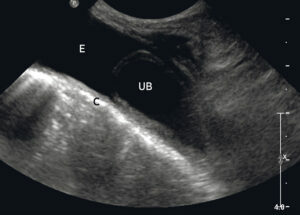 Cystocolic window showing the urinary bladder (UB), descending colon (C), and a large volume of peritoneal effusion (E). If moderate peritoneal effusion is identified at this window, exercise caution when interpreting the appearance of the urinary bladder wall. 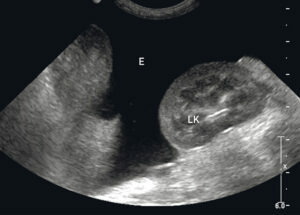 When a curvilinear interface is bounded on either side by anechoic fluid (e.g., urine within the urinary bladder lumen and peritoneal effusion outside), refraction artifact (also known as edge shadowing, pseudo-urinary bladder rupture, or edge dropout artifact) may occur at the tangential interface with the ultrasound beam, giving the appearance of a discontinuous urinary bladder wall. The appearance of effusion in the CC window (Figure 4) should not be confused with a true rupture of the urinary bladder, in which the urinary bladder will be collapsed. The hepatorenal (HR) window can be challenging to obtain, especially in large dogs. The right kidney is located within the renal fossa of the caudate process of the caudate lobe of the liver in dogs; in cats, it is typically separated from the caudate lobe of the liver by retroperitoneal fat. Relative to the left kidney, the right kidney is generally in a more cranial and lateral position. Figure 5. Hepatorenal window showing the right kidney (RK), liver (L), and scant interposed peritoneal effusion (*). To obtain the HR window, place the probe caudal to the right 13th rib, ventral to the lumbar hypaxial musculature, and fan dorsomedially to search for the interface of the right kidney with the liver. The relatively cranial position of the right kidney generally makes it necessary to angle the probe cranially before fanning. In large-breed or deep-chested dogs, a dorsolateral, 11th or 12th intercostal space approach may be necessary to visualize the right kidney. In the HR window, anechoic material between the hepatic parenchyma and the the kidney represents a retroperitoneal or peritoneal effusion (Figure 5). The TFAST examination involves assessment of both hemithoraces for pleural space disease (presence of gas or effusion) and pericardial effusion. With training and/or experience, the examination can include focused echocardiography as well as assessment of the peripheral pulmonary parenchyma for peripheral or diffuse lung diseases. Once the patient is stabilized, the lungs should be completely evaluated by obtaining 3-view thoracic radiographs. In echocardiography, the machine logo marker is positioned on the right of the screen so that cranial on the dog or cat is to the viewer’s right. This is opposite from abdominal ultrasonography. In the following description, the probe and the machine logo positions are the same as those used for an abdominal scan. Figure 6. Schematic diagram of a TFAST examination performed in right lateral recumbency. The DH window is not part of a routine TFAST examination; however, by angling the transducer cranially and increasing the depth on the image, the sonographer can have another window to evaluate the pleural space, accessory lung lobe, and cardiac structures. CTS, chest tube site; DH, diaphragmatic-hepatic window; PCS, pericardial site. From this position, the interface between the pulmonary (visceral) pleural surface with the costal (parietal) pleural surface is identified. In a normal individual, the rhythmic to-and-fro motion at this interface constitutes a glide sign (Figure 7). The absence of a glide sign is indicative of gas within the pleural space. If pneumothorax is identified in a dyspneic patient, therapeutic thoracocentesis is indicated. When normally inflated, the pulmonary parenchyma cannot be visualized using ultrasound. 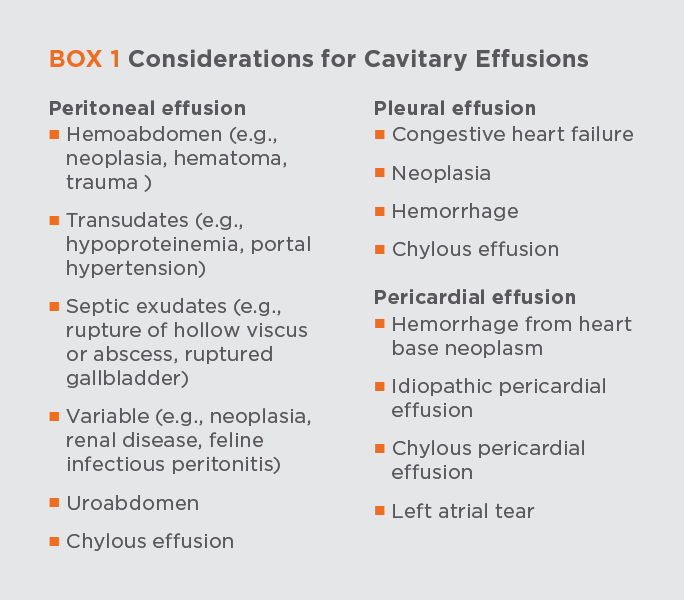 Thoracic (pleural and pericardial) effusions have identical ultrasound characteristics to peritoneal effusions. In the presence of sufficient thoracic effusion, pulmonary atelectasis occurs and the collapsed lung parenchyma may be visualized as well-defined, triangular echogenic structures floating within the effusion. Thus, thoracic effusion can improve the acoustic window to the pulmonary parenchyma as well as the heart. 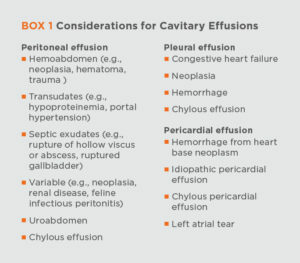 Considerations for thoracic effusions are listed in Box 1. Figure 7. 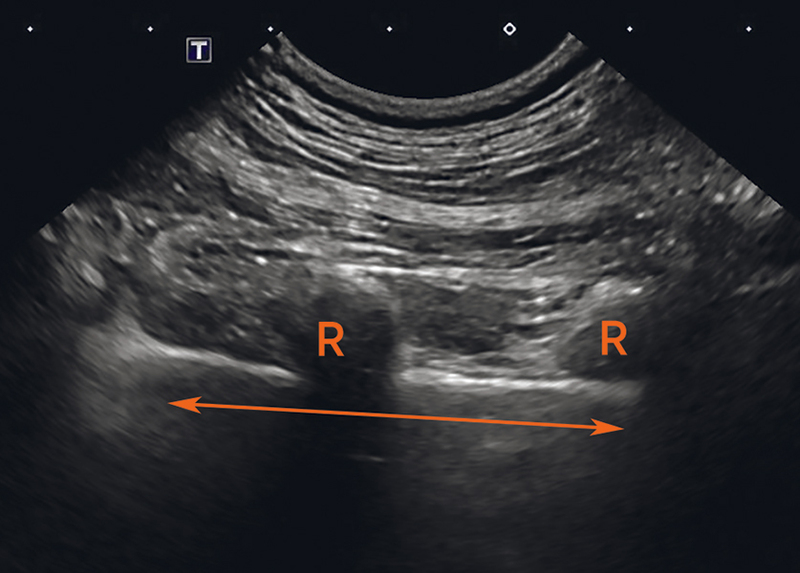 Dorsal plane ultrasound image of the pulmonary–pleural interface (double-headed arrow), indicating a positive glide sign: the rhythmic to-and-fro motion of the pulmonary pleura along the costal pleural surface during normal respiration. The ribs (R) create a curved hyperechoic line over an anechoic area; their associated shadows originate from the superficial aspect of the rib and extend through the pulmonary–pleural interface. The primary goal of the veterinary bedside lung ultrasound exam (Vet BLUE) is to identify diseased pulmonary parenchyma. Diseased lung tissue often involves additional fluid or cells within the interstitial and/or alveolar spaces (i.e., wet lung), resulting in increased penetration of the ultrasound beam beyond the visceral pleural surface. Vet BLUE exploits this phenomenon by utilizing the ultrasound findings associated with wet lung as an indicator for pulmonary disease. This examination is useful when critical patient status prevents thoracic radiography. Differential diagnostic considerations for wet lung must take into account the distribution of affected lung tissue as well as the specific patient context. For example, identifying wet lung caudodorsally in an electrocuted patient or a patient with a history of seizures could indicate noncardiogenic pulmonary edema, while wet lung at the site of blunt trauma may indicate pulmonary contusion or hemorrhage. The distribution of pulmonary changes is best assessed using survey thoracic radiographs, which should be used subsequent to Vet BLUE to evaluate the entire lung fields, pleural space, extrathoracic structures, cardiovascular structures, and mediastinum. Figure 8. Right lateral radiograph showing the probe positions during the Vet BLUE examination. The arrows indicate the starting point (cdll) and the ending point (crll). cdll, caudal lung lobe, crll, cranial lung lobe; mdll, middle lung lobe; phll, perihilar lung lobe. Vet BLUE assessment of the pulmonary parenchyma involves the bilateral evaluation of 4 windows: the caudodorsal lung lobe region, the middle lung lobe region, the perihilar lung lobe region, and the cranial lung lobe region (Figure 8). At each position, the transducer is oriented cranially so that the company logo on the image is to the viewer’s left, between ribs, such that the pulmonary–pleural interface in association with the adjacent rib shadows resembles a partially submerged alligator with eyes peering above the water (referred to as the gator sign; Figure 7). Horizontally oriented hyperechoic A-lines are equidistant lines caused by reverberation artifacts of the lung margin, or reverberation artifact from the normal pulmonary–pleural interface (Figure 7). The presence of A-lines in conjunction with a normal glide sign indicate normal, dry lung. Figure 9. (A) Dorsal plane image from a dog with wet lung documenting the presence of B-lines (orange arrows). This finding is associated with peripheral or diffuse pulmonary pathology. (B) Right lateral radiograph from the same dog documenting the diffuse unstructured interstitial pulmonary changes. The final diagnosis was diffuse vasculitis with interstitial edema on histologic evaluation. Wet lung is indicated by the presence of B-lines, which are hyperechoic lines running perpendicular to A-lines that oscillate with respiration (Figure 9). These lines are sometimes referred to as ultrasound lung rockets or ring-down artifact. Etiologies for the presence of B-lines by distribution are listed in Table 1. The probe position for identifying pericardial effusion has been described as the pericardial site: ventrolateral along the thoracic wall, within the 5th to 6th intercostal spaces, bilaterally (Figures 6 and 10).4 Pericardial effusion appears as anechoic or echogenic material surrounding the ventricular and/or atrial free walls, bordered by a thin curvilinear echogenic structure representing the pericardium (Figure 10). Figure 10. 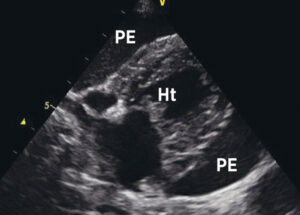 Thoracic ultrasound image obtained at the pericardial site showing a large amount of anechoic pericardial effusion. Ht, heart; PE, pericardial effusion. If a large volume of effusion (accumulated over a long time) or a small volume of effusion (accumulated over a short time but creating elevated intrapericardial pressure) is present within the pericardial sac, cardiac tamponade might be present. Tamponade is characterized by collapse or inward motion of the right ventricular and right atrial free wall throughout the cardiac cycle, particularly during early diastole, when pericardial pressures exceed intracardiac pressures. 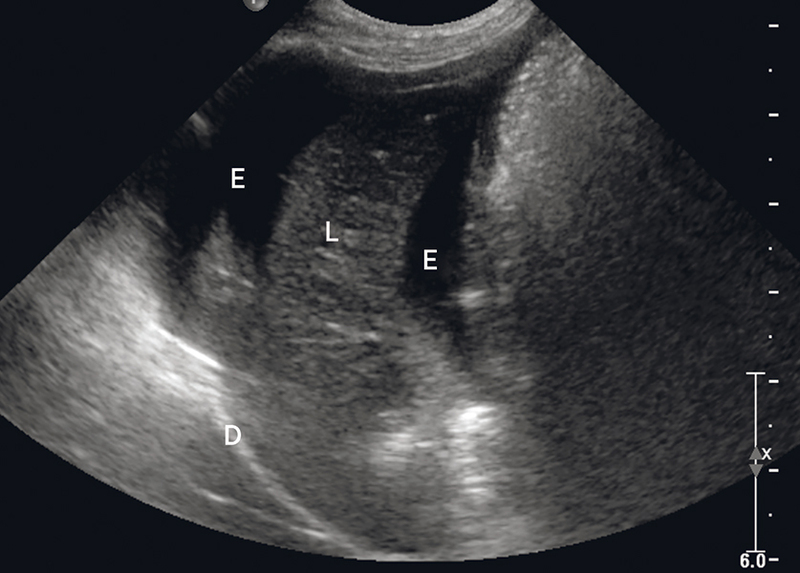 If pericardial effusion is identified in a hemodynamically unstable patient (e.g., cardiac tamponade), ultrasound-guided pericardiocentesis is indicated. Scant pericardial effusion may not be immediately life threatening but always warrants further investigation. AFAST and TFAST require limited anatomic study, and nonradiologist veterinarians can achieve proficiency with training. Assessment of the left atrial chamber dimension in relation to the aorta can aid in the diagnosis of congestive heart failure. Normal left atrium-to-aorta ratios in the dog and cat are 1.3 and 1.5, respectively.9,10 A right-sided, parasternal, short axis view at the level of the heart base is most commonly used for assessing left atrial size. 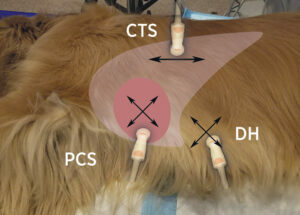 This view is generated by placing the probe along the right ventral thoracic body wall at the point of the elbow, with the marker oriented towards the patient’s tail. Obliquity of this projection can distort the appearance of the left atrium, and care must be taken to ensure true orthogonal beam orientation to the long axis of the heart. Focused echocardiography findings must always be considered in the context of additional physical examination and diagnostic findings. Radiographs are ultimately required to diagnose congestive heart failure. The AFAST and TFAST examinations are powerful diagnostic tools used in a variety of patient settings. Whenever ultrasound is available, these examinations can provide the clinician with immediate, actionable information at minimal risk to the patient (e.g., minimal time; minimal restraint; no radiation involved). Ultrasound is an advanced imaging modality, and a complete examination requires advanced training and thorough cross-sectional anatomic knowledge. In contrast, AFAST and TFAST require limited anatomic study, and nonradiologist veterinarians can achieve proficiency with training. Lisciandro GR. Abdominal and thoracic focused assessment with sonography for trauma, triage, and monitoring in small animals. J Vet Emerg Crit Care 2011;21(2):104-122. doi:10.1111/j.1476-4431.2011.00626.x. Boysen SR, Lisciandro GR. The use of ultrasound for dogs and cats in the emergency room. 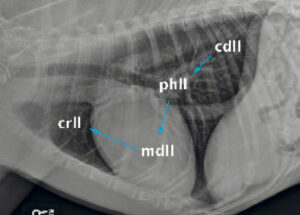 Vet Clin N Am Small Anim Pract 2013;43(4):773-797. doi:10.1016/j.cvsm.2013.03.011. Boysen SR, Rozanski EA, Tidwell AS, et al. 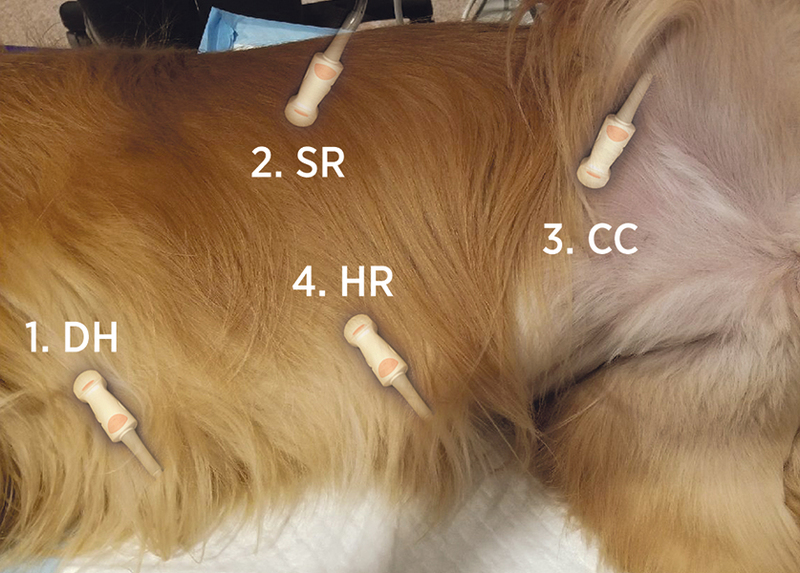 Evaluation of a focused assessment with sonography for trauma protocol to detect free abdominal fluid in dogs involved in motor vehicle accidents. JAVMA 2004;225(8):1198-1204. doi:10.2460/javma.2004.225.1198. Lisciandro GR, Lagutchik MS, Mann KA, et al. 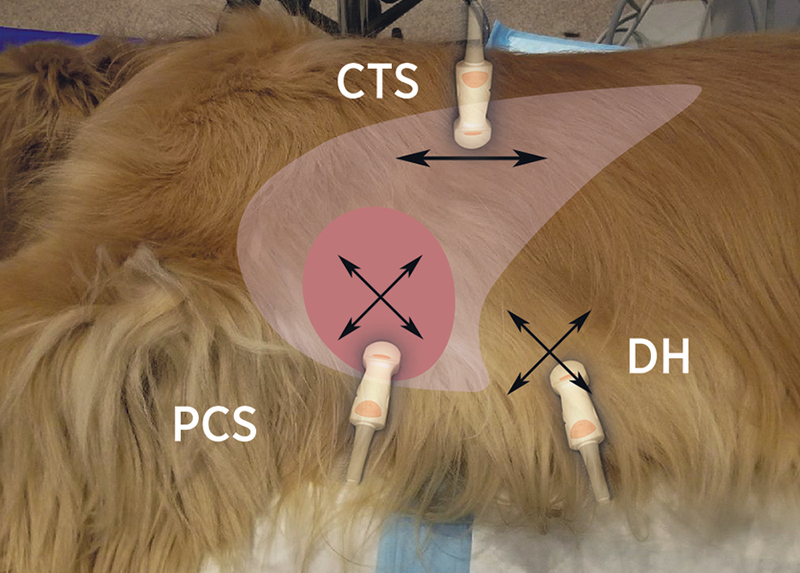 Evaluation of a thoracic focused assessment with sonography for trauma (TFAST) protocol to detect pneumothorax and concurrent thoracic injury in 145 traumatized dogs. J Vet Emerg Crit Care 2008;18(3):258-269. doi:10.1111/j.1476-4431.2008.00312.x. McMurray J, Boysen S, Chalhoub S. Focused assessment with sonography in nontraumatized dogs and cats in the emergency and critical care setting. J Vet Emerg Crit Care 2016;26(1):64-73. doi:10.1111/vec.12376. Mattoon JS, Nyland TG. Ultrasound-guided aspiration and biopsy procedures. In: Small Animal Diagnostic Ultrasound. Elsevier Health Sciences; 2014; 50-77. Ianniello S, Di Giacomo V, Sessa B, Miele V. First-line sonographic diagnosis of pneumothorax in major trauma: accuracy of e-FAST and comparison with multidetector computed tomography. Radiol Med 2014;119(9):674-680. doi:10.1007/s11547-014-0384-1. Choi J, Kim A, Keh S, et al. Comparison between ultrasonographic and clinical findings in 43 dogs with gallbladder mucoceles. Vet Radiol Ultrasound 2013;55(2):202-207. doi:10.1111/vru.12120. Rishniw M, Erb HN. Evaluation of four 2-dimensional echocardiographic methods of assessing left atrial size in dogs. J Vet Intern Med 2000;14(4):429-435. doi:10.1111/j.1939-1676.2000.tb02252.x. Abbott JA, MacLean HA. Two-dimensional echocardiographic assessment of the feline left atrium. J Vet Intern Med 2006;20(1):111-119. Boon JA. Veterinary Echocardiography. 2nd ed. Ames, IA: Wiley Blackwell; 2011.